Sports fever runs deep in Austin, especially come fall when the University of Texas Longhorns take to the field for a season of high-energy and hard-hitting football. Team spirit permeates the city, and fans of all ages can get in on the sports-watching action at these Austin hot spots. Irish enthusiasts and alumni unite at B.D. Riley&apos;s to cheer on Notre Dame teams. It&apos;s also the only pub in town showing every New England Patriots game. Considered one of the top sports bars in the country, Pluckers satisfies ravished fans with delicious wings and non-stop sports. Cheer on your favorite team from the shores of Lake Austin at Abel&apos;s on the Lake. Chow down on Texas-style brunch items and flutes of mimosas as TVs blast football games in the background. Chill at the copper bar at Zax Restaurant & Bar, which features daily happy hour specials and pint night every Wednesday, and is dog-friendly. 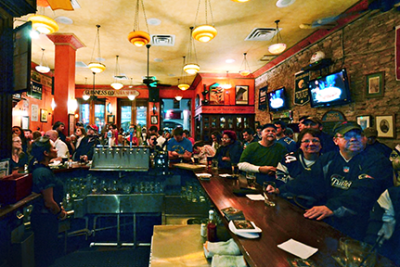 Flat-screens and large plasmas cover the walls at Little Woodrow&apos;s, so your favorite team is never too far from view. Loyal fans keep bleeding burnt orange even after leaving UT, and the Texas Exes alumni group invites all of them to the Etter-Harbin Alumni Center during home games for the largest tailgate in Texas. Outside the alumni center there&apos;s even more tailgate action. Parking lots throughout the campus and along Trinity are filled with tailgating fans of all ages, grilling up barbecue ribs, throwing the pigskin and trading stories of games gone by. Hang out with the crowd at Crown & Anchor Pub, with more than 30 taps and 100 bottles/cans, ciders and wine. Be sure to try their famed burgers, cheese fries and nachos. The bustling scene at Posse East will make you scream "hook ‘em horns" in no time. Grab a pitcher and some tacos y mas at this diner-style bar that&apos;s been around for over 40 years. Even more viewing parties for Austin SEC alum can be found throughout the city. The tailgate never ends in Austin.